I had never heard of Bruegger's bagels, but apparently there's one in Oak Park. Their claim to fame? Authentic kettle-boiled bagels fresh from the oven. My father made bagels when I was very young. All I remember is that I got to roll them into snakes and form them into the doughnut shapes before he dropped them into a pot of boiling water, then baked them. I also remember that they were delicious, and the benchmark against which I measured every other bagel I ever ate. I also grew up in a time when the only people who knew about bagels were New Yorkers and Jews. My best friend when I was 9 or 10 was at our house in Houston one morning and saw a bagel for the first time. I couldn't believe she didn't know what it was and promptly cut one in half, toasted it, spread a schmear of cream cheese on it,and presented it to her. I was ripe with expectation at her enjoyment of a newly-discovered treat. She took a bite and made a face. "It's hard," she said, "and not sweet at all." She was expecting a doughnut, both in taste and texture, and was horribly disappointed. I didn't care. I loved my bagels - plain, poppy seed, garlic, onion and my all-time favorite: sesame seed. My idea of heaven is a toasted sesame-seed bagel with cream cheese and lox. Once bagels became more widespread, it was inevitable that they would morph into more unusual flavors. While I do not, and never will, consider blueberry and cinnamon raisin to be legitimate bagel fare, I can grudgingly accept that others do, and that they happily consume them on a regular basis. It's almost as if, because they look like doughnuts, people keep trying to sweeten them up. But I cannot wrap my mind around this new product that Bruegger's Bagels is introducing for the holiday season: the cinnamon-roll bagel. I've become reconciled to the fact that people seem determined to sweeten up a savory roll. But a cinnamon roll bagel? Why? What purpose does it serve? 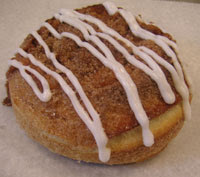 If you want cinnamon roll flavor, why not just eat a cinnamon roll? Why ruin a perfectly good bagel? I mean really. I don't know what it is, but it certainly isn't a bagel.